The Horror Movie BBQ: Stinkor Smells Like A Winner! 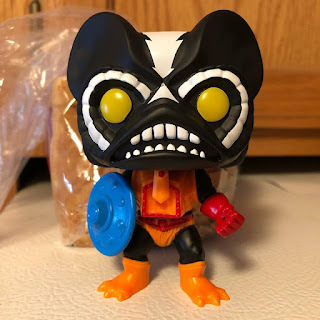 Last year's San Diego ComicCon exclusive MOTU Pop was a big winner. Scare Glow, an obscure character with such a unique gimmick? 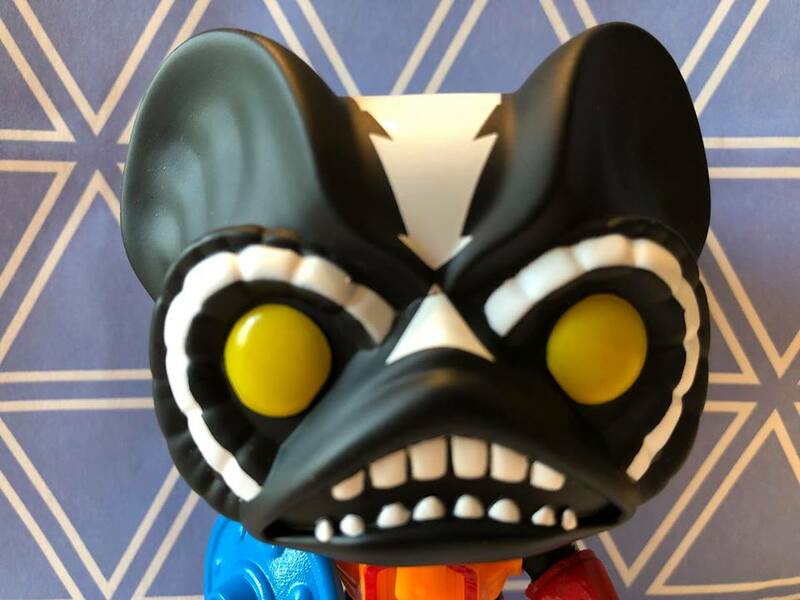 Totally made for a Funko Pop! If ScareGlow was such a huge success, how would they follow it up the next year? Stinkor! Of course! I smell a giant pile of money. At least I hope that's what I smell. 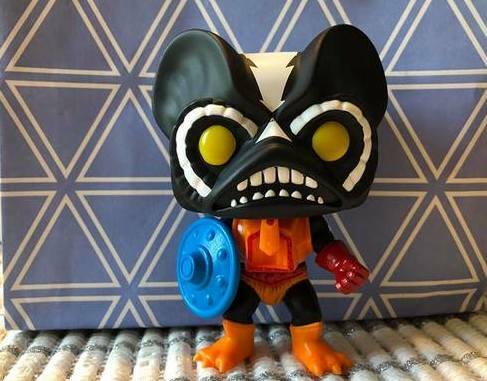 The most odious member of the MOTU mythology was a perfect choice to be given the Pop treatment! Brilliant! If you're gonna do a gimmicky character, why not go with one who smells?!? Stinkor, was the most hated skunk on Eternia with a rather controversial history. Stinkor was a character that actually had a smell to him. Not just a figure that you press a button and emanates a smell. Nope, I'm talking straight up patchouli mixed with the plastic. A rather genius idea because once kids heard they could own a figure that smelled like a dirty fart, they wanted it even more. Parents weren't too thrilled to purchase their kids a figure that stunk up their house. 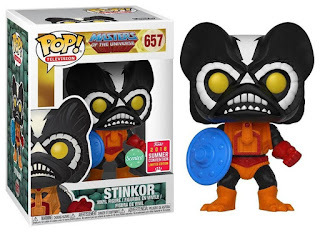 A lot of parents said no with their wallets and Stinkor went forgotten for a long time outside of the "oh yeah, I remember that" discussion. 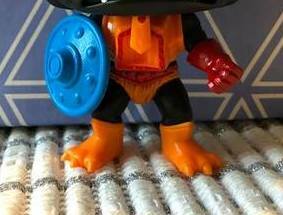 Of course, Funko was happy to exploit the gimmick this with one of this years most popular exclusives. Stinkor was announced as a SDCC exclusive a few months ago and fans were already to call in favors and try to get their hands on this at all costs. Thankfully, a limited amount of figures were released on FYE.com and in stores, but it didn't take long for those to sell out. First thing I noticed was the head. I'll be honest, when this was announced I expected a repaint of MerMan's head just to keep tradition but giving Stinkor his own head sculpt helps add to the unique release. Anytime we can see an exclusive figure with an original sculpt, I'm ok with it. Oh man, that odor. No mistaking that one. It smells exactly like he smelled back in the day mixed with a cheap dollar store air freshener and maybe some English Leather. Of course writing about it isn't the easiest. I don't think you truly understands how bad it is. It's so bad that if you were to hide this in someone's laundry, they'd be shunned for about a month. Imagine having morning breath, coffee breath and smoking about 80 cigarettes, blow into a tupperware container and then open it in about a month to see how it smells. Essentially it smells like if Mickey Rourke fell into a giant vat of Brut and emerged as some weird Brut Beast. Yet, I'm ok with that. 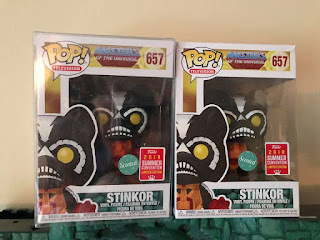 I wouldn't have my Stinkor any other way. It stands out just based off its beloved look alone, but it's smell really makes it memorable. I'm kinda tempted hide this in random spots in my apartment and hold in my laughter as my wife tries to figure it out. It'll be funny. I swear.